There is an obvious traditional death metal foundation to the music of Ectovoid, but the forms and structure are not stagnant or “standardized.” Was Ectovoid formed with this musical prerogative in mind? Christopher: To a degree, yes. Ectovoid was formed with the intention of playing a style of music that resonated strongly with us, while doing our best to avoid certain cliches and stereotypes that tend to appear prominently in underground black and death metal. With that said, I must confess that there was no particular conscious attempt to write deliberately unusual or unorthodox compositions, and indeed several of our earliest songs are much more derivative and comparable to other bands. As we developed our identity and shaped our intentions for our music, we found ourselves taking pride both in the elements of our sound and themes that were recognizably in the death metal tradition and those that lay further outside of it. Maintaining this balance has served as a source of inspiration for us and is something that we are cognizant of as we write music and lyrics. We noticed that Ectovoid’s songwriting is very subtle, frequently introducing great variety, maintaining organic interest, without ever breaking away from a narrowly defined style, and without ever appearing abrupt. How does Ectovoid develop compositions? Christopher: Our compositions have always been developed in stages, with each song typically going through several phases of creative scrutiny before being considered complete. Our bass player and vocalist C.B. writes almost all the riffs for the band, typically on acoustic guitar. Once riffs and passages are conceived, they are brought to rehearsal, where C.B. and myself arrange and refine the material on drums and electric guitar. When enough material has been written to be arranged into a complete song, we begin rehearsing it as a full band, which typically develops the compositions into more nuanced states. We sometimes further change or enhance aspects of the songs while recording in the studio as well. Lyrics are written by myself completely separate from the other band members, typically in a basic form far before they are ever applied to songs. Linking a title and concept to a song is an important part of shaping it during the early stages of the creative process. We try to rehearse songs for a considerable amount of time before recording them. After playing the same song repeatedly over a long period of time, the three of us all tend to start experimenting with different instrumental touches to keep ourselves interested as we play and to add to the song’s depth. I think this is an important aspect of our compositional development. What is Ectovoid’s perspective on the human position with respect to the greater cosmic landscape, to nothingness, to eternity? Christopher: I take great inspiration from the dualistic nature of mankind’s role and presence in the known universe. It is apparent to me that the limits and inherent fallibility of our perception and cognition have the potential to render us both incredibly weak and enormously powerful. In the greater cosmic landscape, we are unquestionably tiny and insignificant, yet simultaneously it is our ability to perceive and exist in this landscape which gives it depth, color, and significance beyond that of a barren and stagnant void. We fear or attempt to sanitize death and the assumed nothingness that awaits us on the other side, and yet the nature of death itself makes its true experience seemingly impossible or insignificant to all who directly succumb to it. We constantly strive through multiple arenas of our collective society to achieve eternity through endless life or consciousness, and yet reaching this threshold would immediately shatter any semblance of meaning and purpose that humanity desperately seeks or already claims. Ultimately, we think it is important to maintain a nuanced perspective on these issues, and to regard them with the humility that they deserve. We recognize that any coherent position on these topics must be based on perception, and not a claimed certainty. It seems possible that one day scientific discovery will shed a final light on these topics that currently eludes us, but until them, our position remains one of contemplation, inquiry, and exploration. Do you think the death metal genre is to be taken as a fantastic escapism, an entertaining parenthesis in our civilized lives, or is it an intimation of a darker psychological reality? In more precise terms, can death metal be a way to reveal and exacerbate the Jungian Shadow within us? Christopher: I think the answer has elements of both of the interpretations you describe. It’s a musical style that achieves escapism by shifting focus to the parts of our psyche that we must generally overlook during our day-to-day lives. Real death metal takes the average person’s musings on death, mortality, other worlds, and the nature of existence and elevates them from specters on the fringes of consciousness into the center of our thinking. In this sense, death metal is indeed escapist in nature, but achieves this through a fixation on very real elements of our being that most either overlook or deliberately avoid, even if they are portrayed in an over-the-top or even campy fashion. This is a big part of what separates it from other forms of metal with more direct fantasy themes. If death metal is in fact a window, as all art is, in its own particular fashion, what would heeding the call to chaos and darkness imply for humanity? Would it be a greater, though bloodier liberation, or would it simply spell dissolution and the eventual disappearance of humankind? Christopher: The second option, for sure. Despite the underground metal scene’s focus on heeding the call to the chaos and darkness within us, there is little reason to believe that doing so would manifest into a greater path for humanity. If we were to suddenly throw aside the order of societal laws and conventions, what would ultimately follow this period of massive change? There’s no reason to think that even if succumbing to our darkest urges and passions lead to the liberation that you describe, that we would not eventually progress right back to where we are now, given enough time. 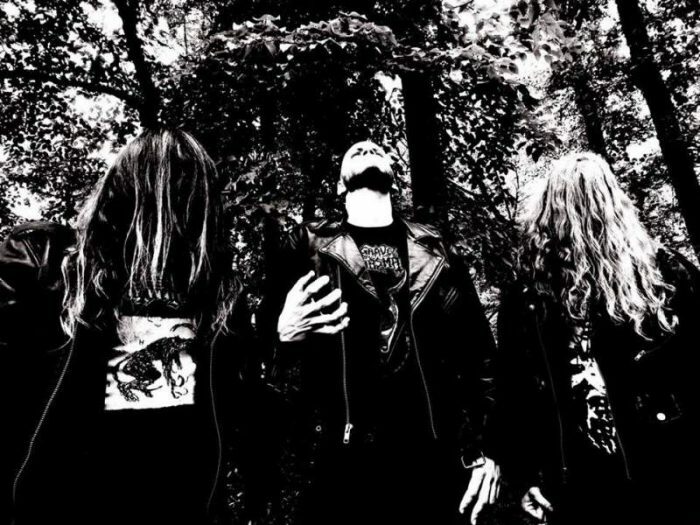 Can death metal be made with the explicit intention of transporting one to such alternate states of consciousness which invite this “otherness,” without musicality and craft being neglected? How can musicians with such aims maintain the balance? Christopher: Some of the finest works of death metal definitely achieve this balance, and it is this quality that is most responsible for the status they possess. One of the things that separates death metal from other “extreme” metal styles is the variety of different methods with which these artistic goals can be achieved. Death metal can be intricate or simple, fast or slow, raw or polished. I would argue that most other styles of underground metal have more rigid stylistic parameters confining them if they wish to achieve a deeper sense of expression. Are there any works in the whole the metal genre that, to you, represent such an endeavor, or which at least personally and consistently ruptures space within or through the mind such that you are transported “elsewhere,” as it were? Christopher: Some of my favorite death metal albums hold that distinction for this very reason. One cannot possibly speak about this quality without discussing the work of Demilich, who hold the rare distinction of achieving complete excellence and supreme individuality in all areas of their craft, from musicianship, to composition, to an artistic mastery at transporting the listener to a world entirely of their own creation. Any aspiring death metal band seeking to compose quality music that embodies these ideals should look no further than Demilich’s output as the peak of their realization. There are others that reach these heights, most of which should hopefully be very familiar to anyone interested in the genre. Autopsy’s Mental Funeral and Morbid Angel’s Altars of Madness definitely come to mind. It’s hard to imagine an album that encompasses the physical and visceral sensations of death and decay more than the former, or the hedonistic and romantic ideals that defines good metal music more than the latter. In terms of newer bands, Grave Miasma is one that is consistently able to alter my perception and consciousness through outstanding musical craftsmanship and an almost unrivaled ability to build atmosphere. In the aforementioned conclusion that heeding the call to chaos spells demise for the human race, we might yet ask, what of evolution? Could chaos be fostered, fomented and followed up in such a way that, in parallel, those with the biological and psychical means and will to ascend, the will to power, will evolve in ways that embrace not a return to primeval chaos and slime, but an ascendance towards predatorial reasoning, and the dark empathy of a higher race on par with the nature of chaotic forces? Christopher: It’s certainly possible, but I must again state that I don’t think this would manifest in a fundamentally different path for humanity as a whole if given enough time to unfold. Our current existence progressed from a history that could be considered very similar to the hypothetical evolution you describe – were not those who conquered and reshaped the world throughout our past those with the same will to power, the will to ascend, and with a similar predatory reasoning? I think the fundamental aspects of our nature would predict a more cyclical form of progression and regression – a sisyphean loop of evolution, armageddon, and rebirth. I do believe that there is an escape from this cycle, but it comes from technology, science, and reason, rather than chaos and passion. True evolution must mean transcendence from material confines, not just societal. But that is a subject for a different conversation. In his book The Gothic Cathedral, Otto von Simpson describes how the transition from the Romanesque to the Gothic style of building represented a change as much spiritual as technical. The main shift having to do with the purposeful incorporation of ‘conceptual’ features in the building into its functional framework, whereas in the past one had a division between function and facade. As such, the design of gothic cathedrals was not oriented towards quantizable efficiency, and instead aimed for a unity of spiritual aesthetic and structural necessity. Does the potentially intricate minimalism of death metal at its best also aim for something that could be likened to this fusion beyond mere appearance or function? Christopher: Absolutely. I would say that is an extremely accurate parallel to death metal’s artistic goals. In the best examples of this art form, even the most excessive or minimalist of musical elements has artistic and aesthetic importance, and seemingly insignificant details can manifest into tools of atmosphere and energy – the sound of a ride cymbal bell, feedback at the end of a track, small imperfections in vocal performance, etc. I think the true difference lies in musicians who use their instruments to convey a conceptual idea, rather than a purely technical one, regardless of how fast or slow or polished or sloppy the final production is. In regards to Ectovoid, what explorations, musical and conceptual, can the interested reader expect in the near and far future? Christopher: We are finally releasing our newest recording, a three-song EP titled Inner Death. These songs were written and recorded a couple of years ago but the release was somewhat delayed for various reasons. We find these to be some of our finest tracks and a good representation of our ideas and goals for our music going forward. Beyond that, we have several live performances already scheduled, and are beginning composition of the material that will eventually make up a third full-length release. Thank you for taking the time to answer this interview for Death Metal Underground. Those instrument dynamics in playing – why the piano became such a beloved instrument after the Baroque period – are exceptionally well done in Ectovoid. It lends an effect of these songs being shorter than they are by being so well played. Love this band. Have since their start. Glad to see them still strong. Great article! Thanks! so… DARG you alive? cool. will you be writing for this site again?